Pairin consoling Maximus and his children after paying his last respect to Joan during the funeral service at the SIB Likas Church yesterday. KOTA KINABALU: It was a touching farewell from Parti Bersatu Sabah (PBS) Deputy President Datuk Seri Dr Maximus Ongkili to his late wife Datin Seri Joan Maluda at her final resting place in Tahantang Cemetery, Kampung Kolopis in Penampang. Joan, 63, passed away from her illness of severe rheumatoid arthritis on Sept 7, leaving behind Maximus and their two children, Rachel Jane and Jordan. “Mummy carried a big heart for the people in the interior of Sabah, and together with my dad, they built a life that was constantly giving back to the lives of others, even if it wasn’t always in obvious ways. “Today, I believe, the seeds of faith, hope and love that she has sown in the years that have gone by have born much fruit in the lives of the people, and I believe that her life will continue to bear much and great fruits, all for God’s glory,” said Rachel. 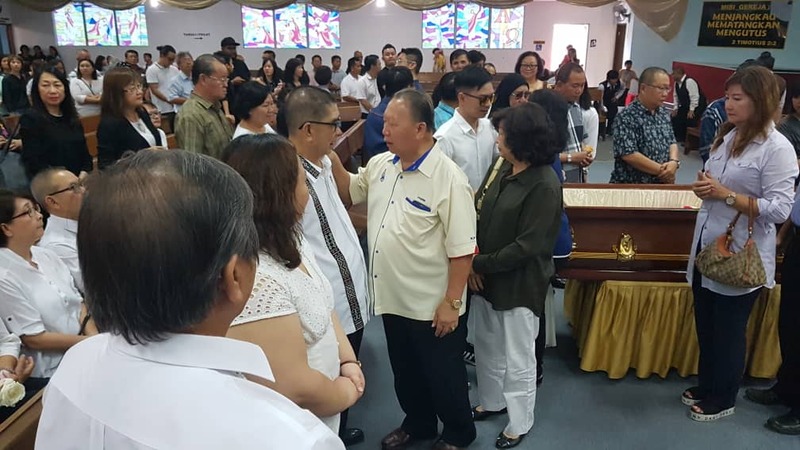 Over 1,000 people paid their last respects to Joan yesterday, including PBS leaders led by president Tan Sri Joseph Pairin Kitingan and wife, Puan Sri Genevieve Kitingan; as well as other politicians, Datuk Seri Masidi Manjun, Datuk Dr Jeffrey Kitingan and Tan Sri Kasitah Gaddam.